As it is not easy to write down good tips, I will do my best. I work a lot with different kind/length of mohair, some stands at fairs have boxes with rest pieces of long mohair (3 for € 5,- or so). These are very useful for plumes on the bears heads. First always read a pattern before you start. My Patterns are most of the time clear, but not always easy to do. Other designers patterns have their own peculiar things. My Patterns are included with seam. 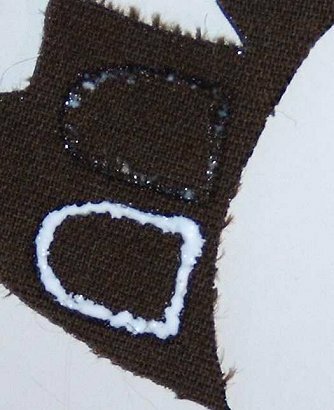 Try to fit the pattern in as less fabric if possible, this way you get left overs which you can use for another bear or purposes. 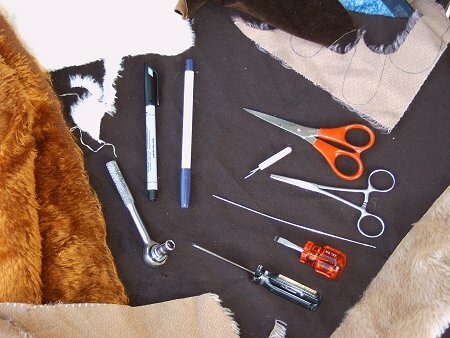 I use silk glue for mohair or cotton kinds which are thin or fray. I glue all lines in, wait till it is dry and cut it out. Be sure that the glue is on the innerline otherwise you cut it off. You can also use this glue for a wet nose effect. I use wax thread to close the seams. 1 thread of wax thread can be devided in 3 thinner threads. 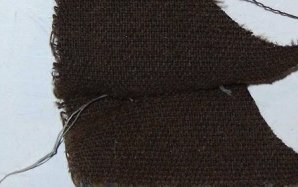 1 thin thread is enough to sew with. 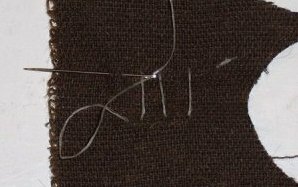 Sew close with a mattress stitch but don't pull after one stitch made. Sew approx 5 stitches. Push it all a bit together and pull tight. At the end cast off the thread in a good way, cause wax thread is slippery.